With the new e-Series platform, Universal Robots sets a new standard for cobots, adding built-in force/torque sensing, unrivaled safety features, and improved precision for faster integration in a wider range of future-proofed applications. Universal Robots pioneered the collaborative robot and continues to evolve its ground-breaking, collaborative automation technology with the introduction of its new flagship line the e-Series cobots. The new UR3e, UR5e and UR10e robot arms will launch in North America at IMTS in Chicago. "The e-Series strengthens the core principles that define collaborative robots: fast set-up, easy programming, flexible deployment, safe operation, and a quick ROI," says Stuart Shepherd, Regional Sales Director for Universal Robots' Americas region. 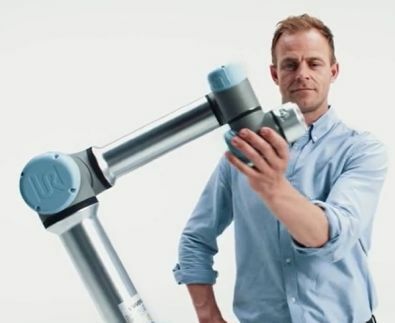 "As manufacturers increasingly embrace cobots, we see the need to support even more demanding applications with the greater accuracy and tool integration of the e-Series." With a new built-in, tool-centric force/torque sensor, the e-Series is ready to take on popular collaborative robot applications that require force control right out of the box such as sanding, buffing, polishing and deburring where force-feedback is paramount in order to obtain uniform results. Additionally, the force/torque sensor can be used to measure mass and perform inspection processes or precisely detect contact. Increased repeatability of 30 microns (0.03mm) in the UR3e and UR5e models and 50 microns (0.05mm) in the UR10e makes the new cobots suitable for precise finishing, assembly and electronics tasks. The 'e' in e-Series stands for Evolution and underpins Universal Robots' key vision of Empowering People and making it Easy for Everyone. "End-users with complex applications and diverse or uncertain future needs will benefit from the e-Series platform and our unique UR+ ecosystem knowing that their investment will be able to grow with them as their needs change," says Shepherd, referencing the rapidly expanding portfolio of certified UR+ plug & play end-effectors, software and peripherals certified for UR cobots now available. To address the emerging need for tool power consumption, the e-Series platform tool power supply now supports up to 2A of peak current. The new cobot line also adds four additional digital inputs with an associated interface for use with conveyor tracking. A new wrist-joint-tool communication interface reduces production line integration time and the hassle associated with routing cables between the end-effector and control cabinet. All joints are field replaceable in under six minutes. "The global cobot market is the fastest-growing segment of industrial automation. The e-Series will continue to propel this class of robots forward into new applications in small machine shops and large enterprises alike. I look forward to introducing the IMTS audience to the e-Series experience," says Shepherd. Universal Robots will start taking orders for the e-Series immediately and plans to begin shipping units to customers in August. IMTS will be the first opportunity in North America to experience the e-Series live.